Freemax may have gotten its start by building white-label vaping products for other companies to sell, but they’ve come a long way since then. 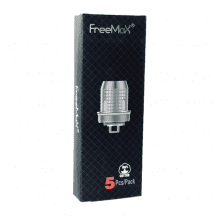 Freemax isn’t just another tank and coil maker anymore; they immediately catapulted themselves to a position of technological leadership in the vaping industry when they released the world’s first tank with a mesh coil. They continued to advance their position with the release of the Freemax Mesh Pro — the first tank with dual mesh, triple mesh and quadruple mesh coils. Do you want to know what it’s like to enjoy true cloud chasing with long-lasting coils that operate quietly, don’t spit and require no ramp-up time? You’ve got to try some Freemax Mesh Pro coils. Freemax coils aren’t just spectacular for their superlative flavor and vapor production. Freemax has also employed a number of technologies to make their coils last longer than the competition. The new Freemax mesh coils, for example, use flax fiber in their wicks to increase heat tolerance and prevent the coils from burning out quickly. If you’re on the hunt for Freemax coils at the best price, you’ve found the right place because the price you see is the price you pay. We don’t charge shipping fees for any order, regardless of the order’s size. Our coils are always guaranteed authentic!